Believe it or not, I really like a good salad. In Texas, when the weather gets warm, it is nice to have a cool, crisp salad. Now, this is not to say I like a really healthy salad. This is me we are talking about. 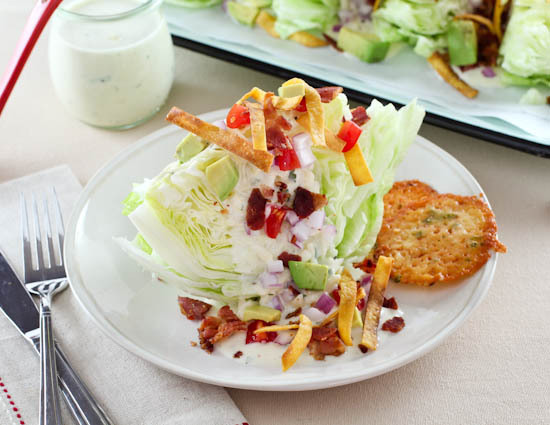 I like a rich, creamy dressing, lots of fresh toppings, some cheese, and – obviously – bacon. Kerrygold asked me to share with you a salad featuring their butter and cheese*, and that is exactly what I have delivered. 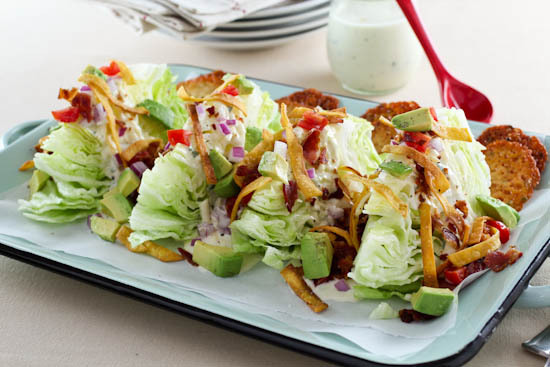 The salad that I have made for y’all today is all the best things about a traditional wedge salad, but with a Tex-Mex twist. The dressing is a cheesy jalapeno cilantro dressing featuring Kerrygold Blarney Cheese. I also added some Kerrygold Aged Cheddar and jalapeno cheese crisps, and I fried some tortilla strips in Kerrygold Butter. You can either serve this salad as an appetizer or as a main course. 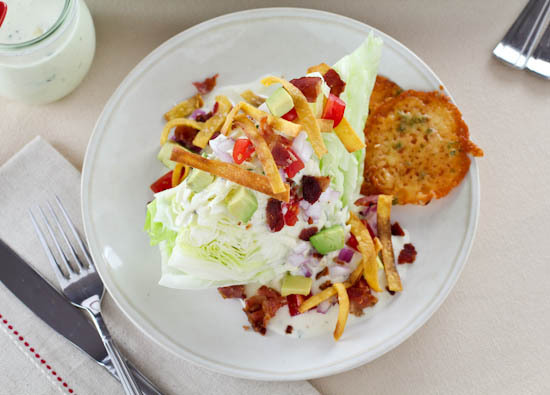 If you are serving as an appetizer use half a head of iceberg lettuce cut into four small wedges. For a main course I would cut the head of lettuce into quarters and serve it with some grilled chicken or shrimp to round out the meal. As I said above, the salad is garnished with some cheese crisps and tortilla strips. The cheese crisps can be flavored anyway you want. I added minced jalapeno, but you could also add some cumin, chili power, or even taco seasoning. 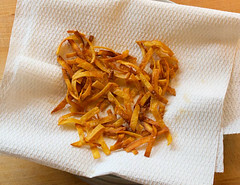 The tortilla strips I fried in butter to add a little extra richness, and nutty flavor. If you prefer to use oil, feel free. You can also add any extra topping you might like, such as black beans, crumbled smoked sausage, or even smoked chicken or pork. The sky is truly the limit here! Begin by preparing the dressing. 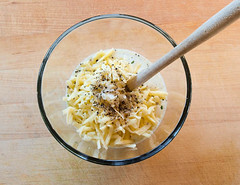 In the work bowl of a blender add the finely shredded Kerrygold Sweet Cheddar, mayonnaise, buttermilk, and half the jalapeno. Blend until the mixture is smooth, about 2 minutes. 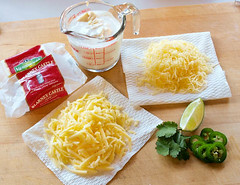 Transfer the mixture to a small bowl and add the coarsely shredded Kerrygold Sweet Cheddar, remaining jalapeno, cilantro, lime juice, salt, and pepper. Mix until well blended, then cover and chill for at least one hour. Next, prepare the cheese crisps. Heat the oven to 300 F and line a baking sheet with parchment paper lightly sprayed with non-stick cooking spray. Combine the shredded Kerrygold Aged Cheddar and minced jalapeno. 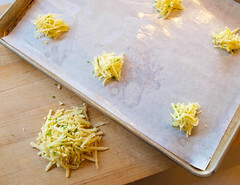 Scoop the cheese using a tablespoon onto the prepared baking sheet, leaving at least three inches between each mound. Bake the cheese for 10 minutes, then remove from the oven and cool for 5 minutes. 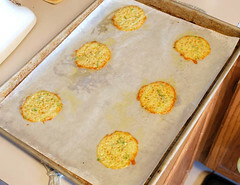 Carefully flip the cheese crisps over and bake for 5 minutes, then remove from the oven and cool for another 5 minutes. 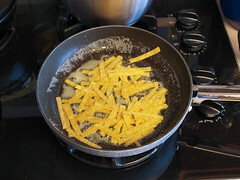 Flip the cheese crisps back over, blot off any excess oil, and return to the oven for 3-5 minutes, or until the cheese is golden brown in the center. Cool on the tray for 5 minutes, then transfer to a paper towel lined rack to cool to room temperature. Next, prepare the tortilla strips. In a medium skillet, over medium-high heat, add the butter. Once the butter melts and begins to foam add the tortilla strips. Cook, turning often, until crisp and brown, about 3 minutes. Transfer to a paper towel lined plate to drain and immediately sprinkle with kosher salt to season. 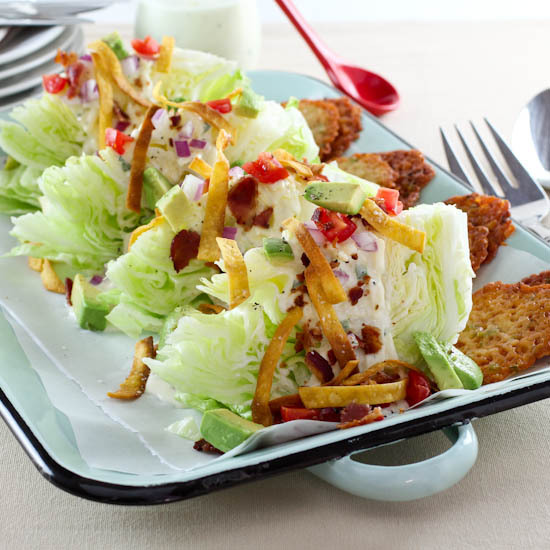 Place the lettuce wedges on individual plates, or a serving platter, and top each with 2 tablespoons of the prepared dressing. Next, add the onions, tomatoes, bacon, and avocado. Finally, garnish with tortilla strips and cheese crisps. Evil Shenanigans Product Review Policy and Disclosure– Kerrygold has provided me with a variety of cheeses and butters at no cost to me, and my participation in this promotion has entered me into a prize drawing, but I did not accept monetary compensation for reviewing or writing about their products. Any opinion expressed is my own and is not influenced in any way by the manufacturer/PR firm. I only review/promote products that I have personally tested and endorse. © 2015 – 2016, Evil Shenanigans. All rights reserved.